The Sorted Books project began in 1993, and it has has taken place on many different sites over the years, ranging form private homes to specialized book collections. The process is the same in every case: I sort through a collection of books, pull particular titles, and eventually group the books into clusters so that the titles can be read in sequence. 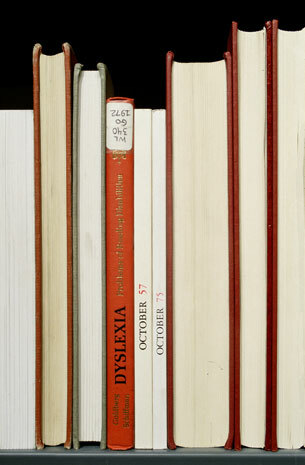 The final results are shown either as photographs of the book clusters or as the actual stacks themselves, often shown on the shelves of the library they came from. Taken as a whole, the clusters are a cross-section of that library's holdings that reflect that particular library's focus, idiosyncrasies, and inconsistencies. They sometimes also function as a portrait of the particular book owner. The Sorted Books project is an ongoing project which I add to almost each year, and there there are hundreds of images in the ongoing archive to date. 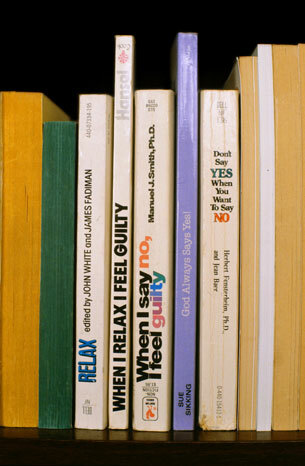 Composition, the first of the book sorting projects, took place in a private home in Half Moon Bay, California. The couple living there were both real estate agents in their forties and had been married for about five yearsÑa second marriage for both of them. They had moved into the house with two discrete book collections that they merged, filling about twenty tall bookcases that occupied the entire middle section of the house. There was a great deal of literature, self-help, and motivational writing in their collection. There were also a number of instances where I discovered two copies of the same book, a telling coincidence that I tried to make use of whenever possible. Reference took place in a now-defunct New York gallery called Spot in 1996. The gallery director, who also lived in the back of the space, was a photographer and former eye surgeon. His book collection reflected his interest in art history, theory, photography and criticism, but there were also many medical reference books left over from his past profession. 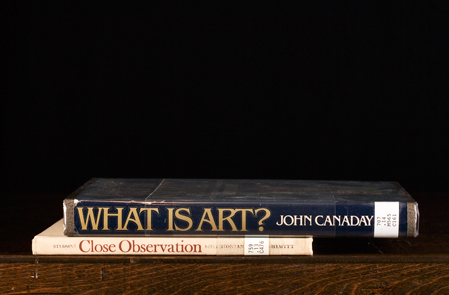 In effect, there were two kinds of books on seeing: the books dealing with vision in the context of art history and criticism, and the books dealing with vision in its most mechancial and literal sense. Pictured above: What is Art? Special Collections Revisited was originally done at the Athenaeum Arts and Music Library in La Jolla, California in 1996, and expanded when I had a chance to visit the library again in 2008. The library is housed in a beautiful Mission-style building in an upscale shopping district. While I was working there, I met many charming retirees who frequented the library, some coming to browse and others working as volunteers. The atmosphere of the library was quiet, romantic, and contemplative, and the library's collection focused largely on famous artists and musicians immortalized as classics of the western cultural past. There was also an unusually large children's book section. When the book clusters were complete, they were exhibited on shelves (with the books stacked horizontally for the first time, since I felt they were easier to read that way) and as see-saw sculptures in the front reading room of the library. 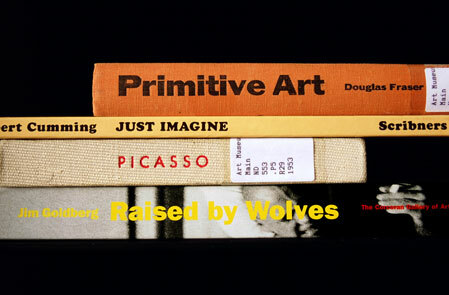 The Akron Art Museum in Ohio commissioned me to do a book sorting using the holdings of the museum's research library. Their book collection had extensive materials and catalogs from various contemporary art exhibtions, as well as many large-format, hardback monographs. The books from the library did not circulate to the general public, and the library itself was so separate from the main exhibition areas that visitors had no idea there was a library there at all. There was a special section on the business and fundraising side of museum administration, books that felt particularly important to use since these activities are often behind the scenes of the exhibitions. When the sorting project was complete, the book clusters were brought to the gift shop located behind the front desk and integrated into the displays. Shark was a journal of art and poetics based in New York. The two editors, a poet and a painter, published the journal from a home office lined wall-to-wall with books, and cookbooks shared space with books on art history and literary theory. 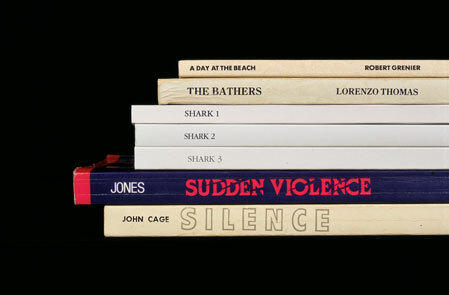 Following an invitation from the editors, a book sorting was done as a project for Shark. The most intriguing part of the library was the extensive collection of contemporary poetry, where many books had particularly unusual titles. Grammatically, many of these titles were quite unorthodox, consisting, for example, of isolated adverbs or sentence fragments. The home of of art patron Linda Pace, founder of the San Antonio art center ArtPace, showcased her extensive collection of contemporary art. There were also numerous books in the house, in both the public and private spaces (including more books, organized on large shelves, than I've ever seen before in a bathroom). Many of the books in the public areas were art catalogs and publications related to the artists in her collection, whereas the books in the private quarters were very personal in nature, dealing with dreams, grieving, and myth, to name a few examples. Combining books from different parts of the houseÑmixing the public with the privateÑbecame the focus of this sorting. When complete, the book clusters were installed upstairs in a private room that had a small library. While on a residency in Stockholm in 2004, the Strindberg Museum generously gave me permission to work with August Strindberg's books. Strindberg lived in a 4th-floor apartment, and a room on the 6th floor housed his research library with the majority of his books. Because many of Strindberg's books were extremely fragile, I spent three days taking digital pictures and writing down book titles on notecards. Then I worked at home, shuffling around the hundreds of notecards to create the clusters and then crosschecking against the digital pictures to make sure the physical properties of the books would work in these combinations. Although I grew up speaking Swedish, this was the first time I sorted books in a language other than English. Working posthumously with a famous writer raised new questions: was the goal to write in Strindberg's voice, to somehow channel him through his books? Was I obligated to express his opinions, or was there space for my own? Did the clusters need to reflect topics from his era, or mine? The breadth of Strindberg's interests was immense. If nothing else, I wanted my book clusters to do justice to Strindberg's omnivorous intellectual appetite, and I felt happiest when this diversity could be reflected within just a single photograph. In 2010, the Delaware Art Museum invited me to work with the books in the M. G. Sawyer Collection of Decorative Bindings. 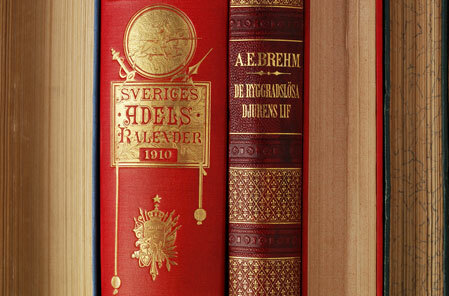 The collection comprises over 2,000 books, acquired on the basis of their cover design. It was an opportunity to take a close look at the culture and history of the United States betweeen approximately 1870 and 1920. Fiction was dominated by themes of travel, romance, science, the automobile, rural American farm life, and the West. The Old World also hovers around the popular imagination in the many books about knights, kings, and European history. A visual and linguistic shift takes place between prim Victorian bindings and the racy dustjackets of books thirty years later. Spectacularly gilded covers reflect the wealth of the United States during certain periods, and austere designs take over during times of belt-tightening. I noticed a curious surge in late 19th-century fiction romanticizing Native Americans and despaired when I realized how this coincided with their violent displacement and decimation. 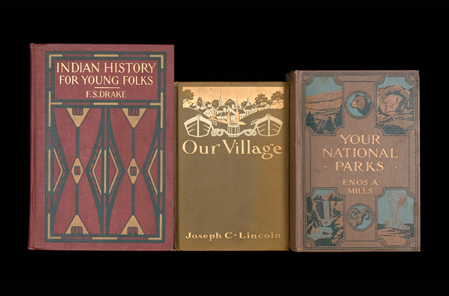 I came to know the books in this collection intimately through several visits to the museum but also by working remotely with their online database of the book covers. I printed out about 700 small-scale copies and spent months arranging them in my studio before coming to the museum to finalize the groupings. This sorting yielded more book clusters than any other, but it was an agonizing last day, and it felt impossible to stop when there was always one more book that begged for inclusion. For the first time I worked with the book covers up, in part because the titles didn't always appear on the spines, but also because the covers were rich with information and so beautiful that I couldn't imagine otherwise. I was invited to work with the books in a family home in Austin, TX in spring of 2013. Two adults and their three kids (aged 14, 17 and 20) lived in a large home with more books than perhaps any other family home I have been in. The adults' bedside tables were piled high with books, with more books under the tables. There were books in the kitchen, the bathrooms and hallways. There was even a large book closet, the contents of which would have been enough for a book sorting project all of its own. It took a long time to look at all the books in the house and I spent two days making an eighteen-page hand-written list, noting all potentially useful book titles, in advance of starting any book sorting at all. Moving through the house was like moving through zones of shifting subject matter and personalities. The adults' home offices had serious books on politics, history, health, care for aging parents, self-help, and a lot of contemporary fiction. In the most public areas I found thick books about design and art history, and art catalogs often related to the art collection hanging in the house. The cookbooks on the kitchen shelves lived in proximity to the books on the flora and fauna of Texas, with some occasional crossover. I was amused to find Texas Snakes near The New Texas Cuisine and decided to work with this happy accident. I spent a great deal of time upstairs, in the kids' rooms. The oldest boy had a lot of outdoor adventure literature, a genre I'm personally very fond of. 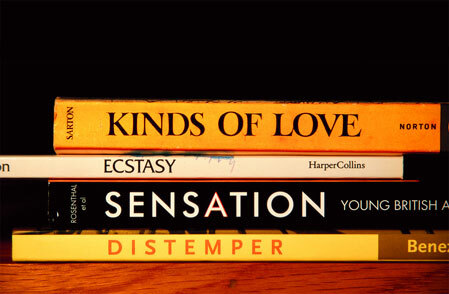 The book spines in the teenage girl's room were predominantly blue, pink, or pastel yellow with language that took a distinctly wordy, chatty, mildly provocative tone. My favorite shelves were the ones with hundreds of picture books that had been read to the kids when they were very young. 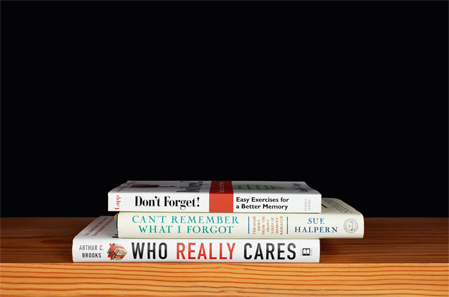 These books had tall, skinny spines and humorous or poignant titles that I often took out of context and merged with the adults' books. Spending many days in the house also attuned me to the pattern of this family's daily life. Kids and adults came and went throughout the days while I was working, and my conversations with them also helped shape the compositions of the book clusters that resulted. 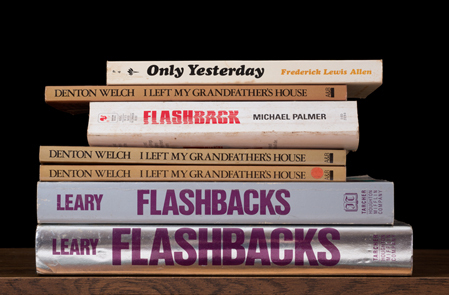 The writer William S. Burroughs lived the last sixteen years of his life in Lawrence, Kansas, and in May 2014 I spent the better part of week there, looking through his personal book collection and eventually constructing a Sorted Books piece. Burroughs's reputation and mythology—not just as writer, but as traveler, drug-user, artist, shaman, muse and friend to many of the Beats—precedes him. I came to his book collection having read some of his work, but by no means comprehensively, nor was I particularly well-informed about the details of his life. Perhaps precisely because of all myth and hearsay, I thought it might be useful to arrive a little under-informed so as to be able to take the books at face value, and to let the books themselves serve as the medium through which I'd come to understand more about Burroughs's life and work. There were about fifty boxes of books in addition to five or six bookshelves. Some were free-standing cases with glass doors that had been kept more or less in the order Burroughs had lived with them. In the cases, books shared space with various small figurines, relics and gifts. Surprises lurked behind many book covers. Burroughs was, famously, a gun enthusiast, and a blue clothbound copy of L'Interprétations de Moliere had a carved-out cavity for a small handgun. In a paperback medical thriller called Nerve with a blazing green skull on the cover, I followed a hole all the way through the book until I arrived at the bullet. His books also reflected a profound interest in animals and wildlife. (I was told by one of his friends that he loved animals, and never hunted—besides the occasional book he might have aimed a gun at, he only shot at targets). He loved cats, and at one point lived with around twenty of them: eight indoors, and twelve outdoors. Many friends gave him books about cats, evident from the inscriptions inside many of the books. References to cats come up in unrelated books as well. In a paperback called "Smack!" with a deadly-looking needle and heroin packet resting on top of an American flag, a cheerful inscription read "Dear William, Thanks for letting me cat-sit!" It was often psychically exhausting to spend time with William Burroughs's books. He clearly had a curiosity about, and high tolerance for, the darker and more extreme forms of human behavior. I came to dread one bookshelf in particular, where the subjects jumped in manic fashion from charming picture books about cats to books about torture and physical interrogation techniques, witchcraft, and strangulation. Burroughs seemed to have a fortitude of spirit that allowed him to delve deeply into subjects like this, whereas spending time with even one of those books could me feeling anxious and nauseated. I looked at a book on shark attacks with pictures so graphic that it gave me nightmares. Some of these books felt like research that fed the stuff of his writing and his imagination. But he clearly read a great deal purely for pleasure too, as evidenced by the enormous number of medical thriller paperbacks in his collection. Burroughs often wrote in his books, but these cheap paperbacks had more marginalia than any other type of book. Long screeds in Burroughs's hand on the implausibility of the plotlines or characters often started the instant after the last published sentence, and continued on for all the remaining end pages (one critique began "Too many outrageous improbables: Reggie would never have $, junk and coke in # stashed under his own name"). His opinions were straight to the point and vividly in his voice. On the cover of a book called How We Die, Burroughs wrote between the lines of the title "Include me out of your we." There were also short, cryptic, and often beautiful phrases such as the one written on the title page of a paperback called Psychward: "We were the first that burst into that silent sea." In a thriller called Lost Souls, Burroughs has written "The tide is coming in from Hiroshima you dumb earth hicks. Sauve qui peut." Kansas Cut-Up, the title I finally chose for my series, is obviously meant to reference Burroughs's cut-up technique for writing, where the use of pre-existing texts, combinatory processes and the embracing of chance are hallmark properties, as they are for "Sorted Books" pieces as well. Being "cut up" also indicates a state of distress about something; a "cut up" is also a term for a mischievous, unruly, funny person. My week with William Burroughs's books made it clear that among so many things that he was, that he was all that too.